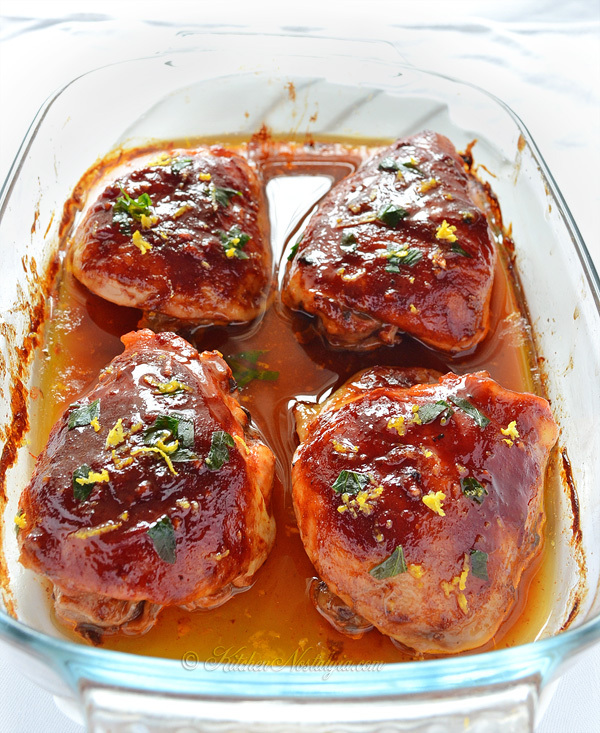 Baked Chicken Thighs is a quick and easy chicken dish, perfect for a busy week night meal. There is no marinating required. Just prepare the sauce, pour over the chicken and pop in the oven! 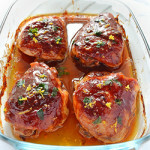 This time I used regular chicken thighs, but you can use boneless, skinless chicken thighs as well. Then you make a quick sauce by mixing ketchup with soy sauce, and vinegar. 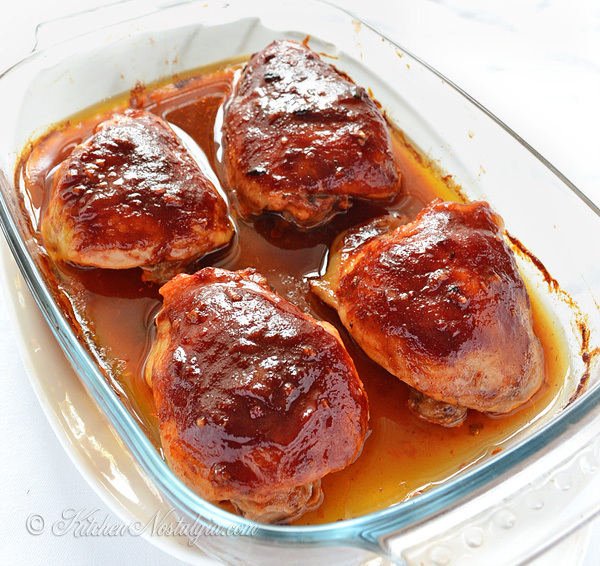 I used small amount of sauce because I didn’t want to drown chicken in the sauce but just to coat it with a glaze. I don’t like meat to taste too sweet so I used only 1/2 Tablespoon brown sugar. You can increase the amount of sugar to suit your taste. I baked he chicken for an hour at 350 F (175 C). Since I don’t have a meat thermometer, the only way I can be sure that the meat is cooked through is to cut it to the bone and see whether there is still some blood left. You can further adjust this recipe by adding some cayenne pepper, oregano, curry, bbq sauce, balsamic vinegar – pretty much whatever you like. 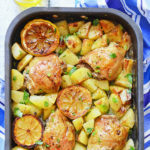 Serve Baked Chicken Thighs with rice and vegetables, with potatoes and carrots, with pasta or any other way you like. Wash chicken thighs, pat dry with paper towel and season with salt. In a small bowl, combine hot ketchup, red wine vinegar, soy sauce, brown sugar, garlic and paprika. Coat both sides of chicken thighs with this mixture. 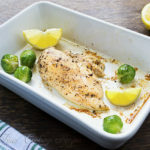 Place chicken, skin sides up, in an oiled baking dish and bake in the oven for about an hour or until chicken thighs are cook through. 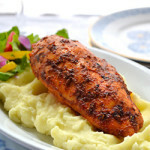 Baste chicken every 20 minutes with pan juices. this may sound dumb….. “hot” ketchup…. Temperature hot or spicy hot? It does not sound dumb. My instructions were probably not clear. What I meant was spicy hot ketchup. 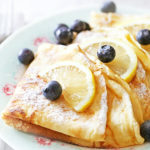 So easy to make and delicious! I see this becoming a regular at our house. I don’t remember any more which brand it was. I believe any thick and spicy ketchup will do. I assume one could just use a regular thick ketchup w/ the addition of some hot sauce(like Frank’s Hot Sauce)? any suggested changes if I want to use Boneless/Skinless breasts instead? If using Boneless/Skinless breasts, shorten the baking time to about 30 minutes. The sauce complimented the chicken very well.I added hot sriracha sauce to the ketchup to make it hot. When chicken was done I added green beans to the sauce and put it in to bake in the oven for 10 more minutes.served with mashed potatoes it made a complete meal. Adding sriracha sauce is a great idea! My very picky daughter loved this and even went back for seconds. I highly recommend this recipe! 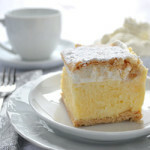 Susan, it is great to hear that your daughter loved the recipe!